Sometimes it happens that a book may speak to you but you can’t speak about the book. It has happened to me a couple of times, with books I loved and was particularly keen to write about: there was Stupid and Contagious by Caprice Crane, which I adored, but no matter how hard I tried my attempted review said nothing beyond ‘funny, brilliant – read it!’ There was Vladimir Nabokov’s The Luzhin Defence, which was especially mortifying as I felt I ought to have had no end of things to say about it, but my review read more or less like, ‘Is it just me or is Nabokov a genius? It isn’t just me? Oh good.’ It happened with Jaclyn Moriarty’s Finding Cassie Crazy, though I did end up writing about it. I often wonder what professional reviewers do when this happens to them. Do they just press on? Can they opt out? As a book blogger, I think it’s especially awful when this happens with a review copy. If the book isn’t to your taste, you can in good conscience abandon it; but if you do like it, you start tearing your hair in effort to do the book justice. Book-blogging, admirable though it is in many ways, does encourage stock responses to literature. You’d like to write a thoughtful review, you read anxiously, you rack your brains for synonyms to ‘thought-provoking’, you ask yourself ‘What can I say about this?’ and grasp with delight and relief at any hint of the I-can-elaborate-on-this factor. What a joy it is to find your very own hobby-horse in a book! Even better are books that deal with the nature of story-telling and reading, for then you can say just about anything semi-intelligent and yours will pass for a thoughtful review. You can never just admit you’ve read it, and… well, liked it. You can never just read. Isn’t that a bit sad? I struggled long with my review of Uphill All the Way, for various reasons. The genre is one I’m unfamiliar with; ‘hen lit’ is too trivial an appellation for a book this serious, but Uphill All the Way is undeniably women’s fiction about (and for?) mature women. (Whether or not you can or should categorise books by age groups, beyond the obvious children/adults division, would be material for an interesting soapbox, I think.) The subject matter didn’t resonate with me personally as it did with Bluestalking Reader. Most importantly, I ‘just read’ it. I didn’t feel that I had anything intelligent at all to say about it, but I was determined to say something because it is a good, honest book that deserves more attention than many more famous titles. Fifty-one-year-old Judith loses her Maltese lover Giorgio in a diving accident, and as he was married – but separated – she loses him twice over because his family make her feel that she can’t even legitimately mourn. Judith also loses her beloved Malta; she can’t bear to stay on the island after her loss and returns to England to grieve. There she has to cope with getting her house back from a tenant, finding a new job, looking after her mother, and helping her sister and ex-stepson, both of whom have woes of their own. Ultimately she has choose between Malta and England, her old life and new, her grief and a new love. At first I felt the book was perhaps too densely packed with everyday troubles both serious and less so, but then I realised that’s the way life is; it rarely gives you a chance to grieve in peace. The people around Judith are often exhausting and exasperating in a way that only real people can be, for instance her clueless ex-husband with a knack of ‘[bringing] anger to what had been a perfectly amicable situation’. The cover makes Uphill All the Way look like a very bleak book indeed, but actually this is a book about hope, about rebuilding your life after a loss – and it does a very good job of reminding that even a second chance at life is never the last chance. My reading journal says ‘not perfect, but moving, uplifting, & made me feel happy to be alive’. That’s all that needs to be said, I think. I would have thought, on the contrary, that blogging is the very thing that would release you/one to say “liked this” “didn’t like that” “this one reminded me of my aunt” “this one made me happy because it was about dogs”. That is what I love about real people’s reviews on the internet – that they can just respond as an individual and with a degree of subjectivity and not have to deal with the rest of the world’s opinion unless they want to – which always strikes me as honest – (more honest than newspaper reviews? Maybe not. But freer than newspaper reviews maybe. If you see what I mean.) And it means that taste does get talked about openly and that is helpful when one – as a reader – is trying to work out not where something might fit in a canon of future classics but what one might like and enjoy. Or what a loved one might like or enjoy. I think you should worry less about synonyms for “thought-provoking” and let yourself write what you feel, like the note in your book. I think that gets it across very well. I don’t see the cover as bleak, it gets across the feeling of muffled grief as you described. I think I’d like this book, filled with the interactions of people, which always intrigues me. And the setting of Malta is a nice choice, as that island is so overlooked in fiction. Talking of relaxing I was thinking recently how funny it is that I write comedy and yet the things I find most relaxing to read are often serious or bleak or non-fiction. Or serious bleak non-fiction come to think of it. I think it’s something to do with contrast and taking a rest from what you do the rest of the time by being able to switch off with something completely different. Leena, I can really identify with what you’re saying here and I’m feeling that way at the moment because I’m reading a book that has me completely stunned in terms of what I could ever hope to say about it. I’m am trying to ‘just read it’ without a thought for reviewing. I like the sound of Uphill All The Way. That’s a great point, Rosy, I never thought of it like that, the contrast. Rosy, I see what you mean, but as usual I’m of two minds about it. I just can’t get over the fact that, as book bloggers, we reserve the right to say ‘I liked this, it has a cute cover and the main character reminded me of my boyfriend, which was nice’ or ‘this kind of sucked but I’m not really sure why’ if we feel like it, and yet blogging is touted as the future of criticism and what not, and book bloggers generally get up in arms when anyone suggests professional criticism might be superior. You can’t have it both ways, can you? To me, book-blogging has always been newspaper-reviewing-without-the-newspaper-part – mostly because personal blogging isn’t for me, and largely because I’m at heart a frustrated wannabe newspaper reviewer. But then, professional reviewers don’t – presumably – approach every book as if they were about to review it. They’ve got – again, presumably – two reading lives: one for themselves, one for the public pieces. (‘And the book is a stranger who’ll beckon you on’… sorry, got distracted there for a minute.) And a book blogger would seem to have only one reading life – one that is in some ways poorer, or more reductive at least, than they’d have if they kept it entirely private. Not trying to sound anti-book-blog here, mind you 😉 For some, the approach obviously works, and a lot of people say they get a lot more out of books and actually read a lot more than they did before their blogging days. Of course, the review copy thing is a different can of worms – there was an interesting discussion about it somewhere. I can’t find the links just now, alas. As for the book at hand – I think you’d enjoy Uphill…, Jackie, so I hope you’ll read it! Thanks for a thoughtful review. 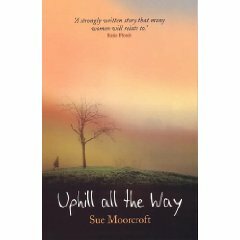 I enjoyed reading it and I’m glad that you enjoyed Uphill All the Way. Malta is much loved by me, as well as Judith, and if I can’t be there myself it’s always nice to send characters there. I’m just finishing writing a serial set in Malta and it’s much nicer to be there in my head for part of each day than in the UK! I have Maltese friends who will answer any number of brainless questions about the island so it’s relatively easy for me to use it as a setting and get all the details I need. The fact that there’s no divorce in Malta, a point on which the plot pivots, was a matter under discussion in the Times of Malta during one of my visits to the island. Giorgio was a Maltese man I watched flirting with another tour guide when I was sitting waiting for my family in Sliema. The book began to build in my mind from there. I hated having to leave the island when I was a child – how much worse would it be to be in love with Malta that was and have to leave as an adult? I identify with your point about never reading entirely for pleasure. As a writer and a creative writing tutor I feel that there’s something to learn from everything I read – so I analyse everything. It’s become automatic and some times I regret it. But it’s part of being a writer. Thank you for stopping by to comment, Sue! Your love for Malta really does shine through from the book. And I wonder what the man you saw would think about having inspired a novel…! This entry was posted on August 31, 2008 by Leena in Entries by Leena, Fiction: general, Fiction: women's and tagged coping, grief, loss, Women's Fiction.